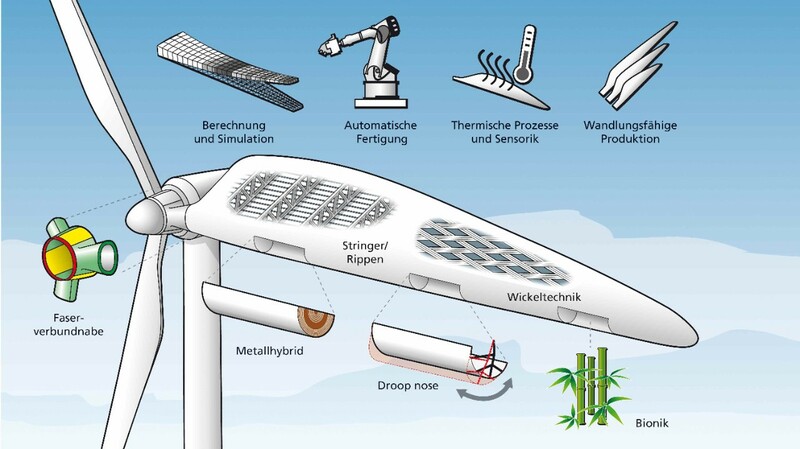 German researchers from the Research Alliance Wind Energy (FVWE) have developed intelligent rotor blades concepts which can adapt to the wind for efficient power generation. The three-year €12m Smart Blades project was funded by the German Federal Ministry for Economic Affairs and Energy, in a joint effort between Research Alliance Wind Energy (FVWE) the German Aerospace Center (DLR), Fraunhofer IWES and ForWind, the Center for Wind Energy Research of the Universities of Oldenburg, Hanover and Bremen. “The project findings provide new information and tools which enable turbine developers and operators to launch more effective, more cost-efficient and more reliable system designs on the market”, the researchers said. They added that when a rotor blade is subject to high wind it turns in such a way that it offers the wind a smaller contact surface, known as bending-torsion coupling. The bending is initiated by the force of the wind alone and is described as a “passive” mechanism. Two approaches were considered that produce this effect including a crescent-shaped geometry and a particular structure for the material composition of the rotor blade. The new approaches were test for cost-efficiency with a state-of-the-art 80-metre-long rotor blade in simulations, with next step for the researchers to be able to test their results on full-scale rotor blades.